Pizza Pizzaz invites you on it's 1-year anniversary celebrations at an exclusive evening with live musical performances by Rapolutionary, Qasim Jaffer, and more. We, at Pizza Pizzaz, are overwhelmed for such a wonderful response to the franchise and are grateful to your continuous patronage. We wouldn't have come this far without you! 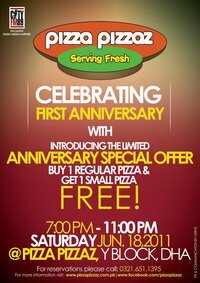 Buy 1 Regular Pizza get 1 Small Pizza for Free!!!! Don't miss out on this evening full of fun and frolic!